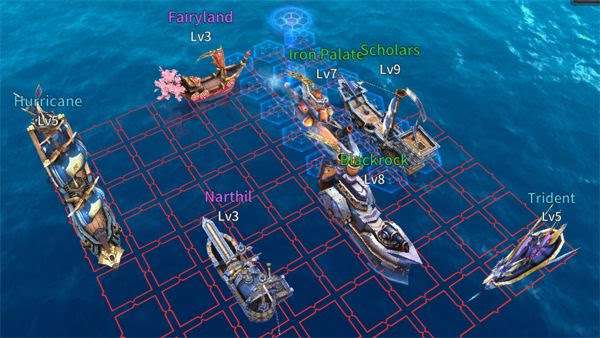 Here's a guide on how to build early game fleets without Legendary Ships in the strategy mobile game Sailcraft Battleships Online. - Only use your Coins for upgrading ships. - Make sure that you always MAX out all ships from your main base. 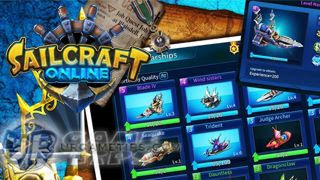 - From your Shipyard, upgrade all Common ships to at least Lvl 5, and all Rare ships to Lvl 3. This will also help you get higher Player Lvl asap. 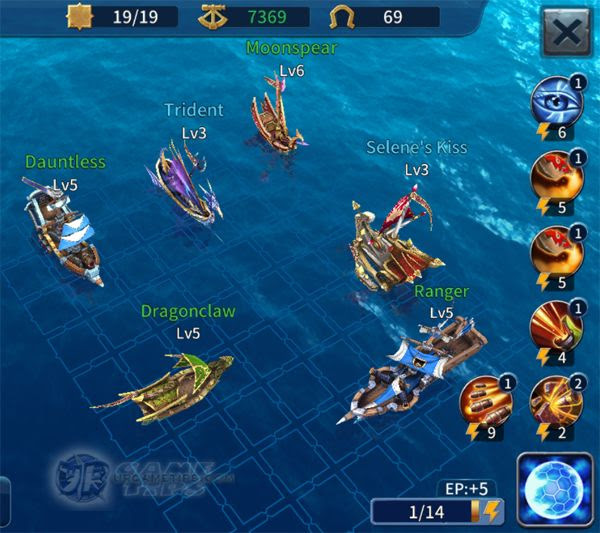 - During early game, the number of ships or total HP available is too limited, so you can't really build a lot of synergies or strategies. 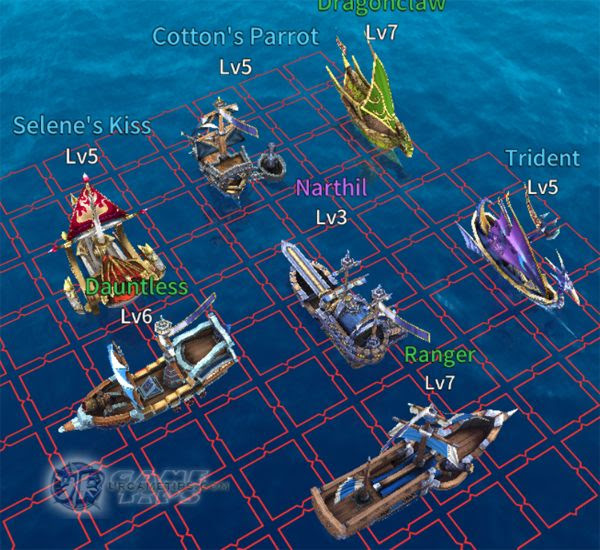 - For now, just go all out and use all ships with "Water Extend" passive skill. - Here's an example fleet for early game at Player Lvl 7 (19 Hit Points). - Spell Used: Magic Shield or Hope Light Lvl 1. - Note: Formation is not optimized, deploy them according to your play style. - Here's another example of a "Water Extend" fleet for early game at Player Lvl 9 and 10 (21 Hit Points). - Should be enough to reach Master League, then Legend League as you upgrade them up. - Spell Used: Magic Shield Lvl 1. - You can also replace Iron Palate with any upgraded ship that you might like, example: the Scholars, or Dragonclaw+Cotton's Parrot (also replace Moonspear). - Basic Strategy: For the 1st few turns, concentrate on firing your Skills with high Energy requirement, except Narthil (situational), use your Shield if necessary. 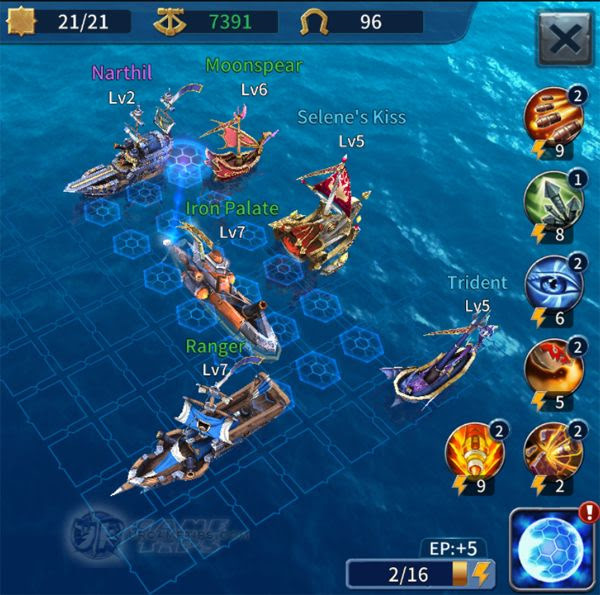 - Once you are able to reach this league, at Lvl 11, your Fleet Hit Points will increase even more, giving you a chance to start thinking of strategies, but first you need to upgrade all ships that you can to unlock their potentials. This might take some time, but keep going. - This is also where most upgraded ships can shine because of their upgrades and synergies with other ships. Note that upgrading your ships will increase their Skills (number of usage) and Passive effects (increased efficiency). - You'll also start to encounter some effective Shield fleets, Rage fleets, or a combination of the two, and many more. - From here on, there are so many ways to create battle fleets, but it would still depend on your available ships and their current upgrades. - Here's some example for F2P players without Legendaries at the moment. - Lvl 11 with 24 Hit Points. - Spell Used: Magic Shield Lvl 2. - You may also replace 1 or 2 water extenders with any ship that you like. - Lvl 13 with 27 Hit Points.